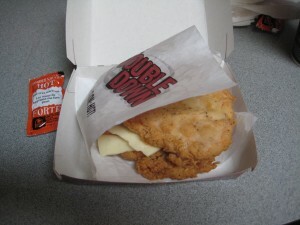 It took months to make it possible, but yesterday I finally ate a Double Down from KFC. Normally, reviwing a sandwich is not my bag. After all, my good friend and neighbour John already does a bang-up job over at In Search of a Sandwich. Why would I want to compete? But the Double Down - KFC’s bacon, sauce and cheese sandwich that substitutes the bread for pieces of deep-fried chicken - transcends a normal sandwich. Just as the Double Down pushes the envelope of sandwich technology, I must expand my blogging horizons for this fast food delicacy. Not since the Earl of Sandwich put meat between two pieces of bread has a sandwich created so much buzz. The novelty of the breadless sandwich coupled with the thrilling sense of danger that accompanies each sodium-filled bite has made the Double Down into something of a pop culture phenomenon, with people proudly announcing on Facebook or Twitter their desire to consume the grease-laden treat, often accompanied by photo galleries shortly thereafter. Diana Mehta, my colleague at the Canadian Press, wrote an excellent feature story on the Canadian debut of the Double Down, including the many health risks associated with downing one of these bad boys. I’ll skip all the warnings from nutritionists though, since I’d like to think my readers are smart enough to know that two pieces of fried chicken with bacon, cheese and special sauce stuck between them isn’t good for you, and move on to the review. I travelled up to York University campus for my Double Down, purchasing my lunch from the combination KFC/Taco Bell at the school’s food court. My eating companions were my fiancé Katy and her co-workers Andrew and Rachel. It was clear that we weren’t the only ones feeling adventurous that day: the outlet had the longest line in the entire food court. After a pretty lengthy wait each of us sat down to our Double Downs and Pepsis. The first bite was, predictably, very greasy and hot although it really did taste good. After the second bite though, the overwhelming saltiness of the Double Down became a problem. Fortunately, Katy had picked up some hot sauce for us to dip our sandwiches into and the spice really helped cut through the savouriness of the sandwich. 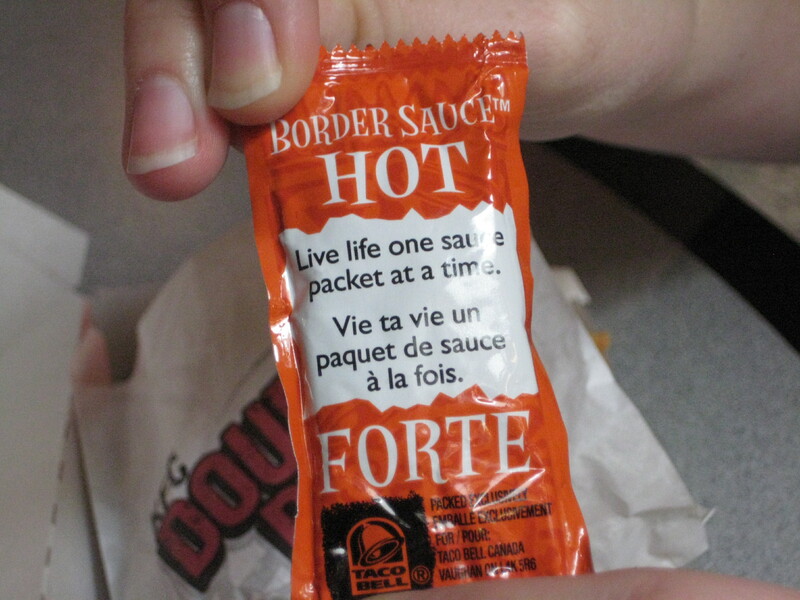 I’d definitely recommend having some hot sauce to anyone trying the Double Down for the first time. The added heat makes it much more palatable. About three-quarters of the way through my sandwich I had a gut-check. Was I going to make it through? My body was already starting to feel uncomfortable with the mess I was forcing it to digest. But I looked at the wad of meat in my hand and decided that although I might regret it, I was still hungry and could easily put the rest of the chicken and bacon away. I was right. In fact, when Katy struggled to finish hers, I was able to eat that too. This sampling had been a long time coming. Katy and I actually had “Eat a Double Down” on our itinerary during our road trip to New York City and Boston this past summer. Unfortunately, we could not find a KFC, and so we had to wait for the Canadian release. That delay probably created an unfair sense of expectation, but we came to an inescapable conclusion: the Double Down is a bit of a disappointment. Don’t get me wrong, it really is quite tasty, if a bit too salty. But when I was done my sandwich I was actually still hungry. I regretted the fact that I didn’t order a combo. I could’ve used the fries to complete the job started by the Double Down. Further, it’s really expensive. The sandwich by itself is $6.99 before tax. I can get a more filling – and healthier – meal from countless fast food chains, so why would I eat the Double Down, aside from the novelty? I’m sure I’ll have it a few more times, undoubtedly as part of a full combo meal with some hot sauce to dip the sandwich into, but I can’t imagine that the Double Down is going to be a success in Canada.